CALDART, V.M. ; Iop, S.; Lingnau, R.; Cechin, S. Z. 2016. Communication in a noisy environment: short-term acoustic adjustments and the underlying acoustic niche of a Neotropical stream-breeding frog Acta Ethologica . Peça o artigo por e-mail. BOTH, C.; Madalozzo, B.; Lingnau, R.; Grant, T. 2014. Amphibian richness patterns in Atlantic Forest areas invaded by American bullfrogs. Austral Ecology 48: 76-80. Peça o artigo por e-mail. COSTA, T. R. N.; Lingnau, R.; Toledo, L. F. 2009. The tadpole of the Brazilian torrent frog Hylodes heyeri (Anura; Hylodidae). Zootaxa 2222: 66-68.Peça o artigo por e-mail. TOLEDO, L. F.; Garcia, P. C. A.; Lingnau, R.; Haddad, C. F. B. 2007. A new species of Sphaenorhynchus of Brazil. Zootaxa 1658: 57-68. Peça o artigo por e-mail. KWET, A.; Lingnau, R.; Di-Bernardo, M. 2010. 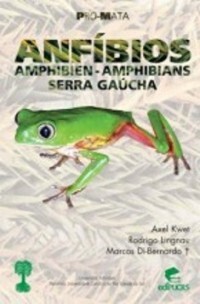 Pró-Mata: Anfíbios da Serra Gaúcha, sul do Brasil - Amphibien der Serra Gaúcha, Südbrasilien - Amphibians of the Serra Gaúcha, South of Brazil. 2. ed. Tübingen: Brasilien Zentrum der Universität Tübingen, 148 p. Compre comigo! Entre em contato para comprar o seu exemplar comigo! Últimas unidades.